Select Medical news | What are Pressure Relieving Mattresses? What are Pressure Relieving Mattresses? As well as these extrinsic factors, there a number of other risk factors, such as age, health, nutrition etc that can combine to increase the risk. Static mattresses deliver pressure relief through the use of high quality foam. Combinations of foam are utilised and some are castellated to further reduce shear and friction. Generally speaking CMHR foam mattresses are suitable for those up to medium risk of developing a pressure ulcer. Visco mattresses are suitable up to high risk or very high risk. Alternating or dynamic mattresses are sometimes called air or airflow mattresses. They use air cells which inflate and deflate alternately, powered by a pump /control unit. As the cells alternate half the cells deflate and the pressure is removed from that area. As this is a cyclical process all areas of the body experience pressure relief as well as movement. This is essential for reducing the risk of pressure ulcers developing. Generally speaking alternating mattresses are suitable for patients up to very high risk of developing a pressure ulcer or for those with existing tissue damage. The cost of these mattresses can vary greatly which does not necessarily reflect the risk level. The cost varies based on the material used for the construction of the mattress, air cells and base, the features and technology the pump offers and many other variables. As a rule of thumb the more you pay the more features you get and the longer the life-cycle of the mattress. 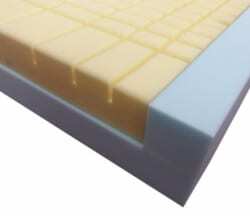 Crossover or ‘hybrid’ mattresses use a combination of foam and air. Generally they can be used in static mode or alternating mode with the addition of a control unit. However, some hybrid systems are non-powered, working on a system of self-adjusting cells through patient movement. Typical designs (below) have a foam core wrapped in an air cell, or have air cells below a foam top layer. Select Medical’s crossover mattress however utilises a unique design. It combines modern foam technology with our proven figure eight air cell designs (below). One mattress can therefore be used with the changing needs of the patient; it can be stepped-up to alternating mode if their risk increases and vice-versa. 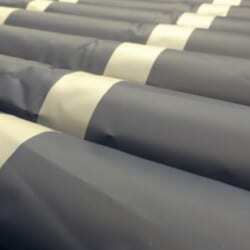 These mattress systems also use air to relieve the pressure but do not alternate. Instead they comfortably immerse the cared for deep into the support surface to carefully reduce interface pressures. Through a combination of strategically located perforations in each individual air cell and a superior vapour permeable mattress top cover, low air loss mattresses are efficient at reducing heat and perspiration on the skin. They therefore help to regulate the microclimate, another factor in pressure ulcer development. The cost of low air loss systems reflects their specialised nature. These mattresses are generally suitable for patients up to very high risk of developing a pressure ulcer or for those with existing tissue damage. Whilst pressure relieving mattresses are an essential piece of equipment in the management of pressure ulcers, they do not replace the need for regular repositioning. Always use clinical judgement.